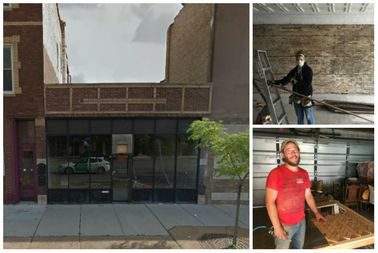 The duo behind The Little Pickle, 3703 W. Fullerton Ave., is aiming for a mid-to-late summer opening. LOGAN SQUARE — The Little Pickle, a new sandwich shop coming to West Logan Square, will focus on hot sandwiches with house-made pickles and sauces, according to husband-and-wife owners Lindsay Malinowski and Bradley Treusdell. The couple is aiming to open the lunch spot, 3703 W. Fullerton Ave., in mid-to-late summer. Malinowski, 32, who has years of experience waitressing and bartending for various restaurants including Letizia's Fiore and Enoteca Roma, will handle front-of-the-house duties, while Treusdell, 35, a former chef at The Radler who helped open Parts & Labor, among other eateries, will man the kitchen. "We thought [a sandwich shop] was a really good fit for the space and the block," Malinowski said. "There's certainly no shortage of great places to get lunch in Logan Square, but there's definitely a lack of diversity in terms of choices." Patrons can expect a cozy, unpretentious vibe with prices to match, according to Malinowski, who grew up in suburban Willow Springs. Hot sandwiches with fillings like roast pork, roast chicken and house-made seitan will cost about $8 each. To start, Treusdell will offer a selection of five different house-made pickles, as well as a variety of sauces, to pair with the sandwiches. "There's nothing I love more than a good sandwich. I'm very Liz Lemon about my sandwiches," Malinowski quipped, referring to Tina Fey's sandwich-loving fictional character on "30 Rock." The couple bought the three-flat at 3701 W. Fullerton Ave., where they now live, and the neighboring storefront in 2015 with the intention of eventually opening a restaurant in the storefront. It took about two years, but the duo is finally ready to fulfill that dream. "We're really confident. We've both been in the restaurant industry a long time," said Treusdell, who is originally from Buffalo, NY. Above all else, the couple wants to make sure the restaurant is welcoming to both longtime residents and newcomers alike, which they said doesn't always happen in gentrifying Logan Square. "I think it's really exciting to see new things coming in, but it's really important to be aware when you move into a place from the outside ... there's a responsible way of seeing what the actual neighborhood's needs are rather than focusing on what you want to do," Malinowski said. Treusdell agreed, saying, "We want to focus on the people who are already in the neighborhood as opposed to bringing outside people in." What neighbors need, the couple argues, is a solid yet affordable sandwich spot with a casual vibe. "This is something we really couldn't find within a quick walk," Malinowski said.